CovRS (or CsrRS) is a two-component regulatory system that regulates the production of multiple virulence factors in Streptococcus pyogenes. covS mutations are often found in isolates recovered from mice that have been experimentally infected with S. pyogenes and covS mutations enhance bacterial virulence in an invasive infection mouse model. In addition, covS mutations were detected more frequently in a panel of clinical isolates from severe invasive streptococcal infections than those from non-severe infections. Thus, covS mutations may be associated with the onset of severe invasive infections. Known covS mutations were divided into two groups: (i) frameshift mutations that caused a deletion of functional regions and (ii) point mutations that caused single (or double) amino acid(s) substitutions. Frameshift mutations are frequent in mouse-passaged isolates, whereas point mutations are frequent in clinical isolates. The functions of CovS proteins with a single amino acid substitution in clinical isolates were estimated based on the streptococcal pyrogenic exotoxin B (SpeB) production and NAD+-glycohydrolase (NADase) activity, which are known to be regulated by the CovRS system. Point mutations partially, but not completely, impaired the function of the covS alleles. We also investigated some of the benefits that a partial loss of function in covS alleles with point mutations might confer on clinical isolates. We found that covS knockout mutants (ΔcovS strains) had an impaired growth ability in a normal atmosphere in Todd Hewitt broth compared with parental isolates having wild-type or point-mutated covS. The loss of CovS proteins in S. pyogenes may confer greater virulence, but bacteria may also lose the ability to respond to certain external signals recognized by CovS. Therefore, point mutations that retain the function of CovS and confer hypervirulence may have natural selective advantages. Streptococcus pyogenes is a Gram-positive bacterium that infects the upper respiratory tract, including the tonsils and pharynx, which is responsible for post-infection diseases such as rheumatic fever and glomerulonephritis. S. pyogenes also causes severe invasive diseases including necrotizing fasciitis [1–5]. S. pyogenes is exclusively a human pathogen and it possesses many virulence factors that help it to resist host defense systems. The production of these factors is thought to be precisely regulated in response to host environmental conditions such as different infection sites or host immune system induction levels [6–8]. In prokaryotes, the regulation of protein production in response to fluctuating environmental conditions depends primarily on two-component regulatory systems, which consist of a sensor histidine kinase and its cognate response regulator . Thirteen two-component regulatory systems have been described in S. pyogenes, of which the CovRS system (also known as the CsrRS system) mediates the control of several virulence factors [10–15]. Specific isolates from mice infected with S. pyogenes exhibited enhanced virulence in mice owing to spontaneous covR or covS mutations [10, 15, 16]. In addition, covS mutations were detected more frequently in a panel of clinical isolates from severe invasive streptococcal infections than in a panel of clinical isolates from non-streptococcal toxic shock syndrome [10, 16–18]. Thus, Ikebe et al. suggested that covS mutations are closely associated with the onset of streptococcal toxic shock syndrome. The strains used for experimental murine infections [10, 15, 16] and clinical isolates  frequently have the M1 serotype, which is the most widely disseminated global serotype [19–21]. Engleberg et al. showed that most covS mutations were frameshift or nonsense mutations in isolates from mice infected with the M1 strain. In contrast, all of the spontaneous changes in CovS detected in clinical M1 isolates  resulted from single amino acid substitutions. Thus, we were interested in why this difference occurred and we hypothesized that it was related to the use of animal-passaged isolates in the first study whereas the latter used clinical isolates. Several covS mutations have been reported in other studies [10, 16, 18] in addition to the two mentioned previously [15, 22]. In the current study, we first reviewed the different types of covS mutations. This suggested that most of the spontaneous changes in CovS detected in clinical M1 isolates resulted from single amino acid substitutions, whereas most of the covS mutations detected in animal-passaged isolates were frameshift mutations. We also showed that covS mutations comprising single amino acid substitutions in the clinical isolates partially, but not completely, impaired the functions of CovS. Finally, we present some new findings and discuss why covS mutations in clinical isolates are preferentially single amino acid substitutions, whereas animal-passaged isolates tend to have frameshift mutations. We investigated all previously reported covS mutations. The covS mutations were found most frequently in M1 isolates rather than any other serotypes [10, 15, 18, 22], and our unpublished data]. The covS mutations detected in M1 strains were divided into two groups: (i) frameshift or nonsense mutations that caused a deletion in functional regions and (ii) point mutations that caused single (or double) amino acid(s) substitutions. Of the 34 covS mutations 25 were detected in isolates from mice infected with the M1 strain were frameshift mutations (Figure 1A and Additional file 1). In contrast, 16 of 29 covS mutations detected in a panel of clinical isolates comprised single (or double) amino acid(s) substitutions (Figure 1B and Additional file 2). Thus, significantly more frameshift mutations were detected in mouse-passaged isolates, whereas point mutations were most frequent in clinical isolates (P < 0.05, Fisher’s exact test). Summary of the analysis presented in Additional file 1: Table S1 and Additional file 2: Table S2. The various point mutations and frame-shifts indicated were mapped as (p) and (f), respectively, onto the CovS amino acid sequence with putative conserved and functionally-important domains: TM1 and TM2, transmembrane helixes 1 and 2; HisKA, histidine kinase domain (phosphoacceptor); HATPase, histidine-kinase like ATPase. See reference  and http://www.ncbi.nlm.nih.gov/protein/7259792?report=genbank&log$=protalign&blast_rank=2&RID=HPZN9V5J01R for additional information about the putative domains. (A) The map was made from the Additional file 1: Table S1. A mutation occurred in a functionally-critical phosphorylation site (shown in bold in the CovS amino acid sequence) of the protein in isolates 5448-APD1, 2, 3, 4, 5, and 10. (B) The map was made from the Additional file 2: Table S2. Isolate FI01 had two point mutations, which were mapped as (p*), as well as isolate NIH286. Isolate NIH44 had two point mutations, which were mapped as (p). The mutation of isolate MGAS2217 was not mapped, because there was not any information about the site. Theoretically, it is possible that a single amino acid substitution has no effect on CovS function, whereas a large deletion may affect domains that are critical for its function. However, we previously observed that all four clinical isolates (strains GT01, K2, AP04, and AP06) with covS alleles comprising single amino acid substitutions had lower SpeB production than a clinical isolate having the wild-type covS when the culture supernatant proteins were analyzed by 2-DE . It is known that covS positively regulates speB expression [11, 13, 14], which suggests that mutated covS alleles degrade the function of CovS . Thus, we were interested in how the functions of CovS proteins with single amino acid substitutions were degraded in clinical isolates. Thus, we deleted the covS GT01 allele encoding CovSGT01A206S (a substitution of Ala206 with Ser) from the GT01 isolate. 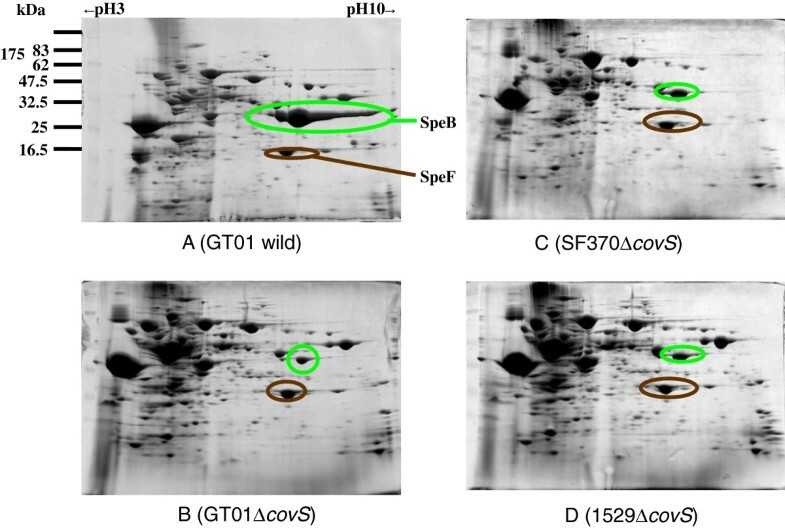 As shown in Figure 2, the resulting GT01ΔcovS had lower SpeB production than the parental GT01 isolate, suggesting that CovSGT01A206S did not completely lose its function. Two-dimensional gel electrophoresis (2-DE) analysis of exoproteins from S. pyogenes GT01 (A), GT01 ΔcovS (B), SF370 ΔcovS (C), and 1529 ΔcovS (D). S. pyogenes strains were cultured in 25 ml BHI-Y broth and the proteins in the culture supernatants were subjected to 2-DE analysis using 13 cm Immobiline Drystrip gels (pH 3–10; GE Healthcare Biosciences Co.). Some protein spots identified by LC-MS/MS analysis are shown. The SpeB spot sizes produced from GT01ΔcovS (B), SF370ΔcovS (C), and 1529ΔcovS (D) were smaller than those from GT01 (A). 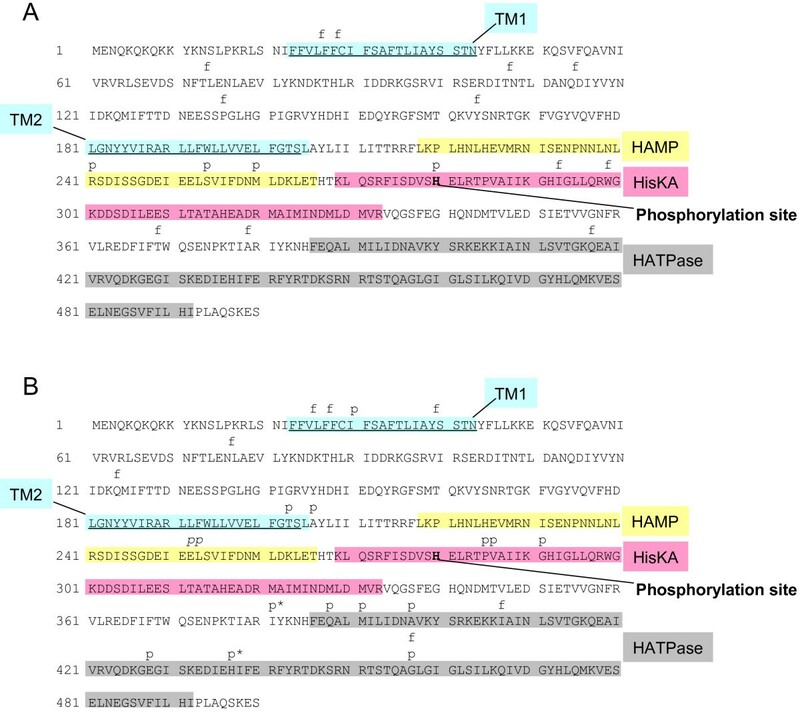 S. pyogenes secretes NAD+-glycohydrolase (NADase) as one of its virulence factors. According to a previous study , mouse-passaged derivatives of a strain carrying wild-type CovS exhibited high levels of NADase activity. A comparison of the entire genome of these strains also showed that one of the mouse-passaged derivatives had only one genetic change relative to the parental strain carrying the wild-type CovS, which consisted of a 7-bp insertion in covS. Therefore, we were interested in the NADase activity of clinical isolates with covS alleles containing single amino acid substitutions. Table 1 shows that strain 1529ΔcovS had a NADase activity level of 93.5 U, which was higher than the level of 3.4 U in parental isolate 1529 with wild-type covS reported in our previous study . In addition, the activity level of strain 1529ΔcovS (93.5 U) was higher than the levels of 62.9 U, 57.0 U, 59.8 U, 60.5 U, and 59.4 U found in the clinical isolates K2, GT01, AP04, AP06, and FI01, respectively, which had point-mutated covS alleles, in this study and a previous study , although isolate CR01 had a level of 114.3 U. The level of GT01ΔcovS was 105.0 U, which was higher than that of parental strain GT01 that carried CovSGT01A206S. Thus, the NADase activity levels in isolates with point-mutated covS alleles were between those of isolates with wild-type covS and isolates with a complete deletion of covS. This was consistent with previous reports [22, 23], where the levels of NADase in isolates KN01, MDYK, and MUY with wild type covS were 6.2 U, 3.0 U, and 3.0 U, respectively. a NADase activity (Units) ± standard error are indicated. One unit of NADase activity is defined as the amount (μg) of β-NAD cleaved per hour per μl culture supernatant, as described previously [23, 31]. Next, we attempted to complement 1529ΔcovS with wild-type covS 1529 or derivatives, which were cloned into plasmid vector pLZ12-Km2. 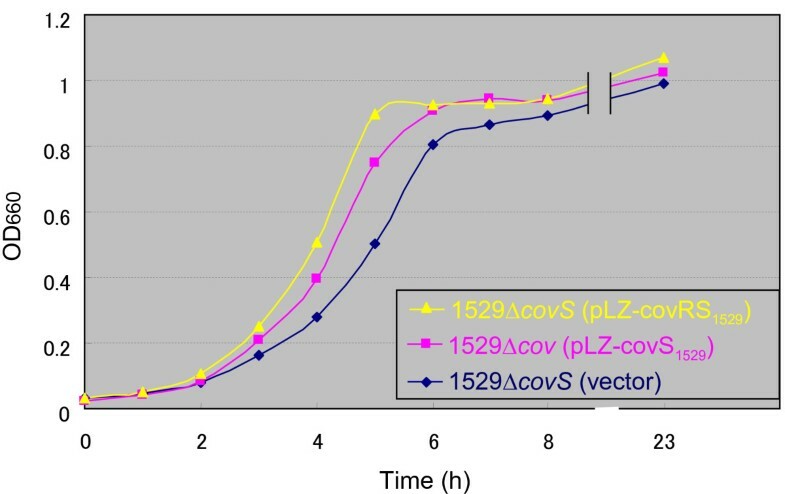 Wild-type covS 1529 from isolate 1529 was cloned into pLZ-covS1529 and it reduced the NADase activity by 71.5 U from 201.9 U of 1529ΔcovS (pLZ12-Km2: control vector) to 130.4 U of 1529ΔcovS (pLZ-covS1529). In contrast, the NADase activity levels in pLZ-covS1529I30L, pLZ-covS1529E428G, and pLZ-covS1529A206S encoding mutated covS alleles from isolates K2, AP04 (or AP06), and GT01 were reduced by 39.2 U, 17.1 U, and 15.2 U, respectively (Table 1 and Figure 2). Thus, the pLZ-covS1529I30L, the pLZ-covS1529E428G, and the pLZ-covS1529A206S certainly retained their abilities to reduce NADase activity, but the abilities were lower than that of the pLZ-covS1529 with wild-type covS. These results suggest that amino acid substitutions, such as I30L, E428G, and A206, partially impaired the function of CovS. According to previous studies [10, 16–18], CovS negatively regulates the expression of certain virulent genes; therefore, a mutation in covS may increase the virulence in mouse models of infection where it plays a crucial role in the onset of severe invasive infections. However, the loss of CovS function means that S. pyogenes can no longer adjust to environmental fluctuations. For example, environmental Mg2+ is thought to be recognized by the CovS sensor protein . Therefore, the partial loss of CovS function may be favorable in nature, but not under laboratory conditions. This hypothesis led us to investigate the benefits of covS in S. pyogenes. Previously, Trevino et al. showed that a covS mutated strain had a lower growth ability than the parental wild-type strain in human saliva, but not in Todd Hewitt broth, which is the standard broth used to culture S. pyogenes. We were interested in the factor present in human saliva that is recognized by CovS; therefore, we repeated this experiment using the isolates 1529, SF370, and GT01. Bacteria were cultured under essentially the same conditions as those described previously . However, the CFU (colony forming units)/ml for overnight THY broth cultures of strains 1529ΔcovS, SF370ΔcovS, and GT01ΔcovS were lower than or similar to those of their parental strains; i.e., 1529, SF370, and GT01, respectively (Figure 3A), whereas the CFU/ml for overnight THY broth cultures of the isogenic mutant 2221covS::7 bp was four times that of the parental strain MGAS2221 reported in the previous study . Thus, we observed two discrepancies: (i) between our results using isolates 1529, SF370, and GT01 (Figure 3A), and the previous results based on isolate MGAS2221  and (ii) between our results with isolate 1529 (or GT01) and SF370. These discrepancies may be because of strain specificities. We did not have strain MGAS2221, so we further investigated the discrepancy between strains SF370 and GT01 or 1529. First, we analyzed the growth curves of the covS mutated strains. SF370ΔcovS, 1529ΔcovS, and GT01ΔcovS all showed delayed growth compared with that of their parental strains; i.e., SF370, 1529, and GT01, respectively (Figures 4A–C). Thus, there was no discrepancy between strains SF370, GT01, and 1529 in terms of their growth kinetics. In addition, GT01 exhibited delayed and advanced growth compared with strain 1529 (or SF370) and strain GT01ΔcovS (Figures 4D and C), which was consistent with our hypothesis that the A206S substitutions partially impaired the function of CovS. Growth ability of covS mutant S. pyogenes in THY broth. The CFU/ml after 23 h, THY broth culture of isogenic covS mutant strains (1529ΔcovS, SF370ΔcovS, and GT01ΔcovS), and parental isolates (1529, SF370, and GT01) are shown. At least three independent experiments were performed and they always yielded essentially the same results. The error bars indicate the standard errors of the means. (A) 5% CO2 was used as an experimental condition. The CFU/ml for overnight THY broth cultures of strains 1529ΔcovS and GT01ΔcovS were lower than those for their parental strains 1529 and GT01, respectively. The CFU/ml for overnight THY broth cultures of SF370ΔcovS were similar to that for the parental strain SF370. (B) Natural atmosphere (NA) was used as an experimental condition. Growth curves of covS null mutants in THY broth. Three independent experiments produced essentially the same results. Representative data from three independent experiments are shown. 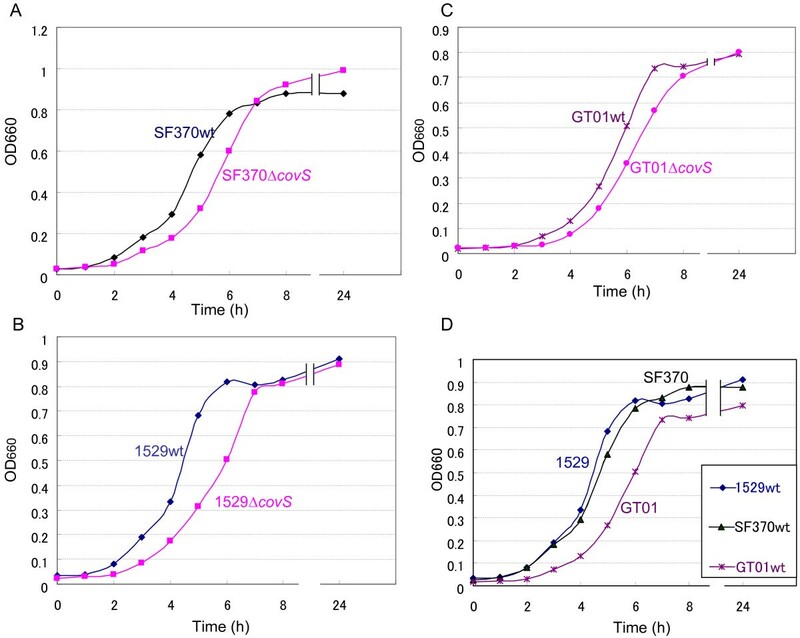 (A-C) SF370ΔcovS, 1529ΔcovS, and GT01ΔcovS all exhibited delayed growth compared with that of their parental strains SF370, 1529, and GT01, respectively. (D) GT01 exhibited delayed growth compared with strains 1529 and SF370. The growth abilities of SF370 and its isogenic covS mutant SF370ΔcovS in THY broth differed from each other when evaluated on the basis of, but not the CFU/ml in overnight cultures (Figure 3A), the growth curves (Figure 4A). This new discrepancy may have occurred because the overnight culture, but not the growth curve, was conducted in 5% CO2, which was the condition described in a previous study . Therefore, we prepared overnight cultures of wild-type SF370 (SF370wt) and SF370ΔcovS in natural atmosphere (NA) conditions. As shown in Figure 3B, the CFU/ml for SF370ΔcovS was lower than that of its parental strain SF370. Finally, we performed supplementary and supporting experiments to test the reliability of this study. covS and covRS cloned into a plasmid vector complemented the delayed growth of 1529ΔcovS (Figure 5). pLZ-covS1529 and pLZ-covRS1529 increased the CFU/ml for overnight THY broth cultures of strain 1529ΔcovS (Figure 6). As shown in Figure 7, 1529ΔcovS was hypervirulent in a mouse infection model compared with the parental strain 1529 (P<0.01), as shown with other strains and their isogenic ΔcovS mutants in previous studies [10, 16]. Growth curves of streptococcal strains in THY broth. Bacteria were cultured in THY broth supplemented with kanamycin (62.5 μg/ml) and the experiments were performed as described in Figure 4. Growth of covS mutant S. pyogenes in THY broth with 5% CO 2 or NA. These experiments were performed as described in Figures 3. The error bars indicate the standard errors of the means. 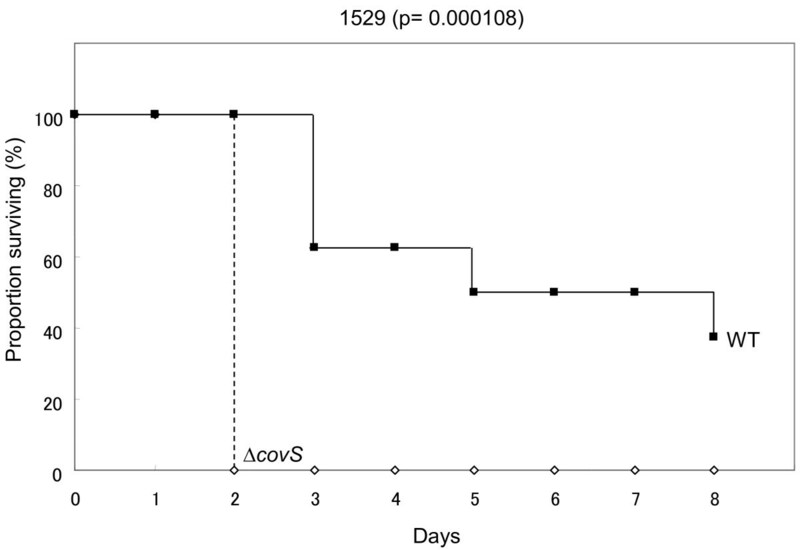 Survival after skin inoculation with S. pyogenes strain 1529 or isogenic mutant 1529 ΔcovS. Data were from two independent experiments and a total of eight mice for each challenged strain. P < 0.01 for comparison between strains. On the basis of our results and those from previous studies we concluded that the loss of covS increases the virulence of S. pyogenes (which is advantageous in vivo). However, the loss of covS also impaired the growth ability of this organism in THY broth (which is disadvantageous in vitro). Therefore, the CovRS system may confer benefits in stages when virulent gene expression is not required. The expression of many genes is precisely regulated so they are expressed only when required; e.g., catabolite repression. Therefore, partial attenuation of the CovRS system to promote resistance to the host defense system appears to be a wise choice for survival in nature. We did not determine the components recognized by the CovS sensor proteins in our experimental conditions; i.e., THY broth, natural atmosphere, or 5% CO2. However, it was probably not the Mg2+ ion, which was suggested previously , because we did not add Mg2+ ion to THY broth. Therefore, we propose that CovS can sense other signals in addition to the Mg2+ ion. Streptococcal strains were isolated as the causative organisms in patients from Japan [22, 23]. S. pyogenes (GAS) strain SF370, which was the most prevalent database reference isolate (accession number NC_002737), was provided by J. J. Ferretti [26, 27]. Streptococcal strains were cultured in brain–heart infusion (E-MC62, EIKEN Chemical Co., Tokyo, Japan) supplemented with 0.3% yeast extract (BD, Sparks, MD, USA), (BHI-Y) broth or Todd Hewitt broth (BD, Sparks, MD, USA) supplemented with 0.2% yeast extract broth (THY) unless otherwise stated. We constructed S. pyogenes strain 1529ΔcovS as described previously . Strains GT01ΔcovS and SF370ΔcovS were constructed using the same strategy . Each bacterial isolate was cultured in BHI-Y at 37°C overnight without agitation. Exoproteins from the culture supernatant were prepared as described previously . In brief, all sample pellets derived from bacterial culture supernatant were dissolved in dehydration solution, which consisted of 7.8 M urea, 2 M thiourea, 2% CHAPS, 0.6% dithiothreitol, and 0.5% IPG buffer. The samples were loaded onto 13 cm Immobiline DryStrip gels (pH 3–10, GE Healthcare Biosciences Co. Piscataway, NJ, USA). The first-dimensional electrophoresis conditions were carried out according to the manufacture’s instruction. Second-dimensional SDS-PAGE separation was performed as described previously . The experiments were repeated at least 3 times to confirm their reproducibility. To construct the plasmid for the covR knockout mutant, the 5′ end of covR (fragment 1) was amplified using the oligonucleotide primer cov R-n6 (5′-GGCTAGCCTTTAGAGAATATGGTTACT-3′) with an Nhe I restriction site and primer cov R-c2 (5′-TCCCCCGGGCTTTGTCATTTATACCAACC-3′) with an Sma I restriction site, while the 3′ end of covR (fragment 2) was amplified using the primer cov R-n7 (5′-TCCCCCGGGGAGAAATAAGTCATATGGAA-3′) with an Sma I restriction site and primer cov S-c10 (5′-GGACTAGTATGTAAAATTAGAGTCCACC-3′) with an Spe I restriction site. Fragment 2 was digested with Sma I and Spe I before its insertion into multicloning site 2 in the plasmid pFW12 . The resulting plasmid was digested using Nhe I and Sma I, and the spc1 DNA fragment containing aad9 (promoterless spectinomycin resistance gene), which was obtained from a Sma I-digested fragment of pSL60-1 , and the Nhe I-Sma I-digested fragment 1 were inserted. This plasmid, covR::aad9/pFW12, was a suicide vector for S. pyogenes. To prepare competent cells, strains 1529 and GT01 were harvested in the early to mid-log phase (OD660, 0.4) and washed twice with 0.5 M sucrose buffer. The suicide vector construct, covR::aad9/pFW12, was transformed into strains 1529 and GT01 via electroporation. The conditions for electroporation were 1.25 kV/mm, 25-μF capacitance, and 200-Ω resistance, and it was performed using a GenePulser II instrument (Bio-Rad, Hercules, CA). After incubation at 37°C for 3 h, competent cells were spread onto BHI agar plates containing 0.3% yeast extract and spectinomycin (final concentration, 100 μg/ml). Selected colonies were cultured from the plates. The cultured bacteria were washed once with saline, resuspended in 10 mM Tris-1 mM EDTA, and boiled for 10 min. Genomic DNA was obtained from the supernatant of the boiled bacteria. The double-crossover replacement was analyzed by PCR using genomic DNA. Successful double-crossover replacement was further confirmed by DNA sequencing. NADase activity was determined using the method of Stevens et al. as described previously . pLZ-covS1529, pLZ-covS1529I30L, and pLZ-covS1529E428G were constructed as described previously . To construct pLZ-covS1529A206S, the DNA fragment was amplified using the oligonucleotide primers covR-n2 (5′-CTTTAGAGAATATGGTTACT-3′), covS-c2 (5′-GTAATTACATTTTGGACAAC-3′), and GT01 genomic DNA as templates with TaKaRa Ex Taq DNA polymerase (Takara, Ohtsu, Japan). The fragment consisted of covR GT01 , covS GT01 , and their 5′-noncoding region, which possibly contained the promoter region. This fragment was cloned into the pGEM-T vector (Promega, Madison, WI, USA). The resultant plasmid was digested with Eco RI and ligated into the same site in the pLZ12-Km2 plasmid  (pLZ-covRSGT01). To construct a plasmid containing only the covS GT01 region, inverse PCR was conducted using two primers, covR-c2Sma (5′-TCCCCCGGGCTTTGTCATTTATACCAACC-3′) and covR-n7Sma (5′-TCCCCCGGGGAGAAATAAGTCATATGGAA-3′), with pLZ-covRSGT01 plasmid DNA as template and Prime-STAR HS DNA polymerase (Takara) to eliminate the covR region. This blunt-ended PCR product was treated with T4 polynucleotide kinase (Takara) and self-ligated. The resultant plasmid was pLZ-covS1529A206S. pLZ-covRS1529 encoding the covRS 1529 operon of isolate 1529 was constructed as described previously . All of the covRS DNA sequences were confirmed by sequencing. All animal studies conducted comply with federal and institutional (the Committee on the Ethics of Animal Experiments of the Nagoya City University) guidelines. The protocol was approved by the Committee on the Ethics of Animal Experiments of the Nagoya City University (Permit Number: H23M-07). All efforts were made to minimize suffering. The ability of S. pyogenes to cause local skin lesions and necrosis in mice after skin inoculation was assessed using a similar procedure to that described previously [23, 33]. Three-week-old female ICR mice (10–12 g) were anesthetized with sevoflurane and the skin of the left flank was laid bare by separating the hair with an alcohol swab, unless indicated otherwise. Bacteria (0.2 ml; 2 × 107 CFU/mouse) grown in BHI-Y were injected immediately beneath the surface of the skin using a 27-gauge needle so a superficial bleb appeared below the skin surface. The number of CFU injected was verified in each experiment by plating bacteria on BHI-Y or sheep blood agar plates and counting the CFU. The survival times were assessed using a log-rank comparison. The R program was used for the statistical analysis http://bioinf.wehi.edu.au/software/russell/logrank/webcite. P ≤ 0.05 was considered significant. There are two supplementary tables. We thank Hideyuki Matsui for technical assistance, and Drs. M. Ohnishi, M. Ato, T. Ikebe for their helpful advices. This study was supported by JSPS KAKENHI Grant number 21790425 and 24590531, a grant from Ohyama Health Foundation, and a grant from the 24th General Assembly of the Japanese Association of Medical Sciences (Medical Science Promotion Fund). The authors would like to thank Enago (http://www.enago.jp) for the English language review. IT conceived the study. IT, RO, and TH designed and performed the experimental work with help by YZ and MI. All authors contributed to the data analysis. IT wrote the original manuscript. TH helped to produce the final manuscript. All authors approved the final manuscript.